I want to tell you right now to go play Final Fantasy Tactics for iPhone and/or iPad. I really do. It's a sublime game with addictive battles and a story as bloody and intricate as any HBO show. And I love being able to play it anywhere, any time. But thanks to Square Enix's ridiculous pricing, I have to add an asterisk to the recommendation. Final Fantasy Tactics has been out for almost a year on iPhone and it'll still cost you $16. The iPad version, which came out this past February, sells for $18. This is obscene. 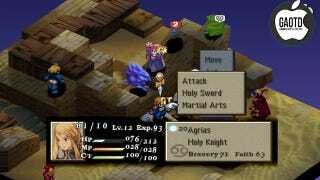 Final Fantasy Tactics first came out in 1998 (although this is a port of the PSP version, released in 2007, which has a few updates, including a new script). $18 for a fourteen-year-old game? Not only can you get roughly 18 awesome games on your iPhone for that price, you can buy Final Fantasy Tactics on your PlayStation 3, PSP, or Vita for only $10. I've asked Square Enix about the discrepancy. Their answer: "We are unable to comment on our pricing models." But if you do dish out the money, you probably won't regret it. It'll take you at least 50-60 hours to get through the main campaign of Final Fantasy Tactics, the bulk of which requires you to maneuver your armies around grid-based battlefields, fighting your way through random monsters and corrupt enemy nations. Guiding you from map to map is a twisty, heart-wrenching story that revolves around a boy named Ramza who is framed, betrayed, and attacked like nobody deserves. To battle, you can recruit and train an army of characters. Some of these characters are generic NPCs that you can assign Final Fantasy-branded classes like Dragoon and Ninja. Others are specialized, scripted allies with their own unique abilities (some of which are way too overpowered). And the touch screen controls actually adapt well to Final Fantasy Tactics. Swiping through menus and maps feels natural, intuitive. This game, unlike many ports, is a great fit for iOS devices. If you're into RPGs, strategy, or cool stories, Final Fantasy Tactics is a must-play. Is it worth the ridiculous asking price? I'll leave that up to you.